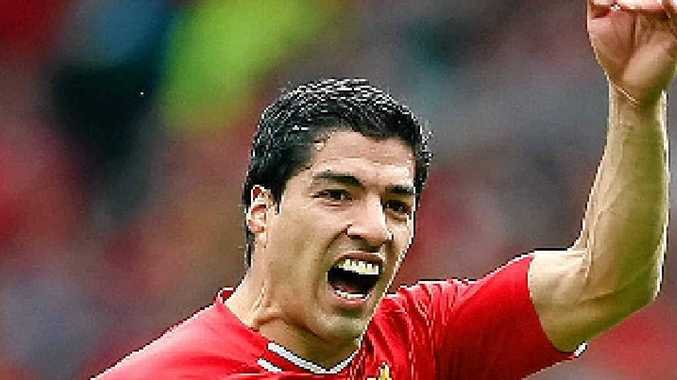 FOOTBALL: Liverpool's Luis Suarez (pictured) was voted the PFA Player of the Year yesterday, but he was unable to stop Chelsea derailing his side's EPL title ambitions with a 2-0 victory at Anfield. A superb defensive display allowed Chelsea to close the gap to two points at the top with two games left. A rare mistake from Reds skipper Steven Gerrard let in Demba Ba to score the opener in first-half stoppage time with Willian also scoring a breakaway goal at the end of the game to wrap up the points. Manchester City took advantage of Liverpool's slip-up with a 2-0 win at Crystal Palace and is three points off the top with a game in hand. Sunderland easily won the battle of the bottom two, defeating Cardiff 4-0 to leave the Welsh side bottom. EPL Team of the Year: Petr Cech (Che), Luke Shaw (Sou), Vincent Kompany (Man City), Gary Cahill (Che), Seamus Coleman (Eve), Eden Hazard (Che), Yaya Toure (Man City), Steven Gerrard (Liv), Adam Lallana (Sou), Luis Suarez (Liv), Daniel Sturridge (Liv).